The light comes on when the lid is opened. 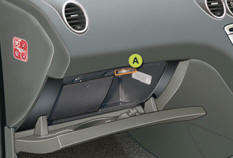 If your vehicle is fitted with air conditioning, the glove box has an air vent A , which can be opened or closed. This distributes the same conditioned air as the vents in the passenger compartment. It also gives access to the dashboard fusebox (refer to the section "Practical information - § Changing a fuse").